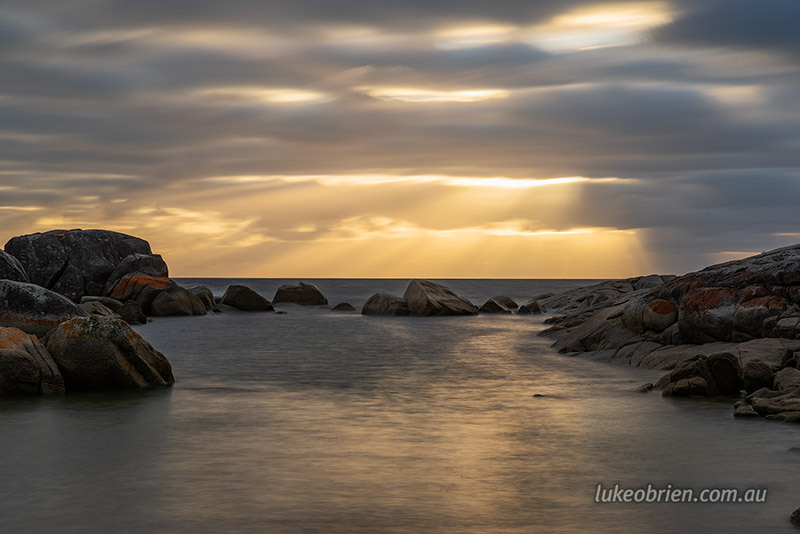 This very crepuscular sunrise was the highlight of one of my Bay of Fires workshops earlier this year. 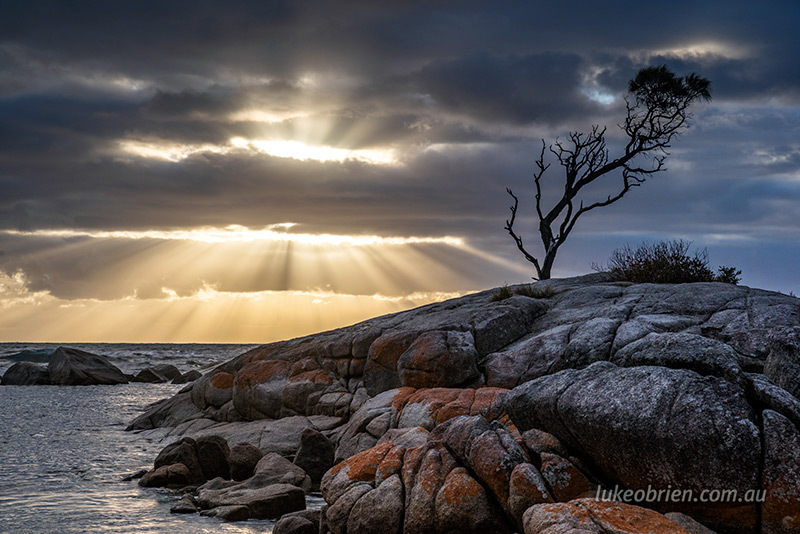 We ventured down to the famous Bay of Fires Tree and the dawn was very grey to begin with, and the pre dawn offered very little in the way of colour and light. Shortly after sunrise however, all that changed, and the sun managed to force its way through the clouds in a spectacular display. The shot above is my favourite pic of the morning, and the shots below show the lead up to the display. First we noticed some “spotlights” coming from the clouds, and started paying closer attention. The shot above is one short exposure form the camera, and the shot below is an “Interval Composite (or Multi Exposure)” as the clouds and light streaked across the sky. 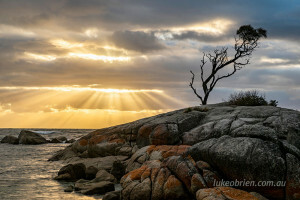 A long exposure of the shot above – technically, an “Interval Composite” whereby you set the camera to take a number of shots and layer them one atop the next, creating the same long exposure effect as a neutral density filter. 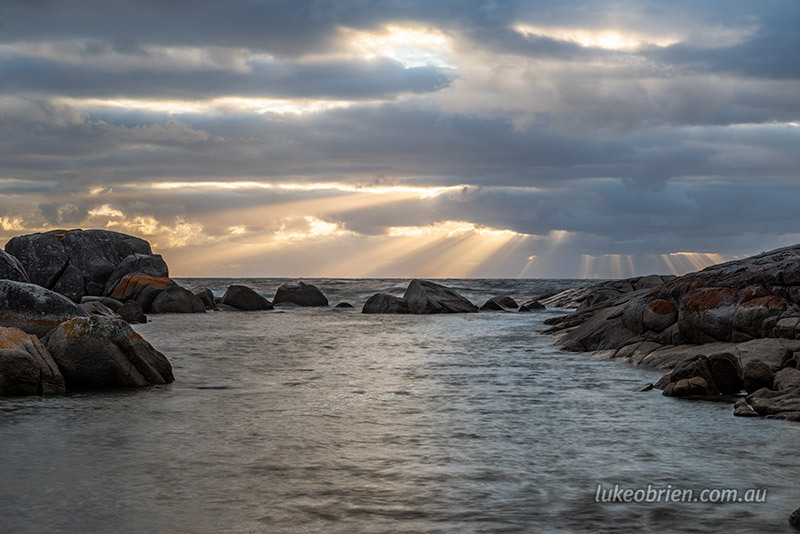 The shot below was shot not too long after the first shot above, and the clouds had moved somewhat allowing some more crepuscular activity. I processed this a little differently too to accentuate the forboding dark clouds. My next Bay of Fires trip is locked and loaded and running in October. There are in fact a couple of spots left so please check out the details here and contact me to book a place if you are keen to come along. This trip is running again in autumn 2019, from April 30 – May 3.